Population Ranked 35th in the U.S.
Ranked 42nd in the U.S.
Nevada is a state located in the western region of the United States of America. The state's nickname is "The Silver State" due to the large number of silver deposits that were discovered and mined there. Much of the state is dry or desert and water became more available for human habitation after Hoover and Davis dams were built on the Colorado River. Nevada encompasses about 70,745,600 acres, making it the seventh-largest state. Slightly more than 86 percent of its land is owned by the United States federal government under various jurisdictions, both civilian and military. Nevada has the highest percentage of its land area designated as federal land over any other state in the nation. Nearly 69 percent falls under the jurisdiction of the Bureau of Land Management or the U.S. Forest Service, with the intent of protection and preservation of both cultural and natural resources. As of 2006, there were about 2.6 million residents, with more than 85 percent of them residing in the metropolitan areas around Las Vegas and Reno. The state is well known for its easy marriage and divorce proceedings, legalization of gambling and, in a few counties, legalized brothels. Today the bulk of the state's revenues come from legalized gambling. Mountains west of Las Vegas in the Mojave Desert. 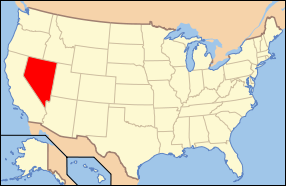 Nevada is bordered by Utah to the east, Arizona to the southeast, California on the west, Oregon to the northwest, and Idaho to the northeast. Nevada is broken up by many north-south mountain ranges. Most of these ranges have inland-draining (unconnected to the ocean by waterways) valleys between them. Much of the northern part of the state is within the Great Basin Desert, a mild desert that experiences hot temperatures in the summer and sub-freezing temperatures in the winter. Occasionally, moisture from the Arizona Monsoon will cause summer thunderstorms; Pacific storms may blanket the area with snow. The state's highest recorded temperature was 125 °F (52 °C) in Laughlin (elevation of 605 feet (184 m)) on June 29, 1994. The Humboldt River crosses from east to west across the northern part of the state, draining into the Humboldt Sink near Lovelock. Several rivers drain from the Sierra Nevada eastward, including the Walker, Truckee, and Carson rivers. The mountain ranges, some of which have peaks above 13,000 feet (4,000 m), harbor lush forests high above desert plains, creating sky islands for endemic species. The valleys are often no lower in elevation than 3,000 feet (900 m). The eastern parts of the state receive more summer moisture and have a slightly more verdant terrain. Sagebrush grows everywhere, and in some places rivers and streams break the desert terrain. The southern third of the state, where Las Vegas is situated, is within the Mojave Desert. The area receives less rain in winter but is closer to the Arizona Monsoon in summer. The terrain is also lower, mostly below 4,000 feet (1,200 m), creating conditions for hot summer days and cool to chilly winter nights due to inversion. Pinion Juniper forests cover large areas of the north and central parts of the state. Bighorn sheep live on Nevada's mountainsides, while pronghorns inhabit the valleys. Other mammals include wild horses and burros, elk, mountain goats, badgers, coyotes, foxes, porcupines, ground squirrels, rabbits, and kangaroo rats. Reptiles include lizards, Gila monsters, and rattlesnakes. Roadrunners, eagles, hawks, owls, grouse, ducks, geese, and pelicans are among the birds to be found. The cui-ui and the Devils Hole pupfish are two fish that are found only in Nevada. Forests cover about 15 percent of the land, mostly in the mountains, including fir, juniper, and pines. The bristlecone pines are the world's oldest organisms. In the desert areas, sagebrush is widespread, giving the state its nickname of Sagebrush State. Cactus, yucca, and mesquite also grow in the desert. Humans are believed to have arrived in Nevada about 11,000 years ago, when the climate was wetter. As conditions became more arid, their lifestyle became nomadic. Four main Native American groups developed: the Washoe (centered around Lake Tahoe), Northern Paiute (in the northwest), Southern Paiute, and Western Shoshone (in the east). In 1776, a Spanish priest, Francisco Garcés, became the first European to enter Nevada. When Mexico won its independence from Spain in 1821, Nevada became Mexican territory. Two fur trappers crossed Nevada, on their way to Oregon and California, in 1826. By the mid-nineteenth century, explorers (including John C. Fremont and Kit Carson), traders, and pioneers were crossing Nevada. After the Mexican-American War (1846-1848), which Mexico lost, Nevada became part of the United States. Congress created the Utah Territory in 1850. On March 2, 1861, the Nevada Territory separated from the Utah Territory and adopted its current name, shortened from Sierra Nevada (Spanish for "snowy range"). 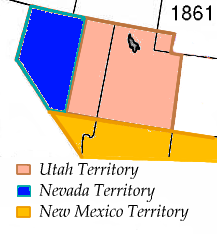 The separation of the territory from Utah was important to the federal government because of the Nevada population's political leanings, while the population itself was keen to be separated because of animosity (and sometimes violence) between mainstream Christians who dominated Nevada and the Mormons who dominated the rest of the Utah territory, especially after the Mountain Meadows massacre of 1857 and the Utah War in 1857-1858. The Comstock Lode was the first major U.S. deposit of silver ore, discovered under what is now Virginia City. After the discovery was made public in 1859, prospectors rushed to the area and scrambled to stake their claims. Mining camps soon thrived in the vicinity, which became bustling centers of fabulous wealth. Between 1859 and 1878, it yielded about $400 million in silver and gold, equivalent to approximately $500-600 billion in 2005. It is notable not just for the immense fortunes it generated and the large role those fortunes had in the growth of Nevada and San Francisco, but also for the advances in mining technology that it spurred. The mines declined after 1874. Wasteful exploitation of the deposits is often blamed for their rapid decline. 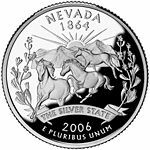 Eight days prior to the presidential election of 1864, Nevada became the 36th state in the union. Statehood was rushed to help ensure Abraham Lincoln's reelection on November 8th. The phrase "Battle Born" on the state flag reflects the state's entry on the Union side during the American Civil War. Mining shaped Nevada's economy for many years. When Mark Twain lived in Nevada during the period described in Roughing It, mining had led to an industry of speculation and immense wealth. However, both mining and population declined in the late nineteenth century. The rich silver strike at Tonopah in 1900, followed by strikes in Goldfield and Rhyolite, again put Nevada's population on an upward trend. Gambling erupted once more following a recession in the early twentieth century, helping to build the city of Las Vegas. Unregulated gambling was commonplace in the early Nevada mining towns but outlawed in 1909 as part of a nation-wide anti-gaming crusade. Due to subsequent declines in mining output and the decline of the agricultural sector during the Great Depression, Nevada re-legalized gambling in 1931. At the time, the leading proponents of gambling expected that it would be a short-term fix until the state's economic base widened to include less cyclical industries. However, re-outlawing gambling has never been seriously considered since, and the industry has become Nevada's primary source of revenue. The Hoover Dam on the Colorado River, located outside Las Vegas near Boulder City, was constructed in the years 1932–1935 using innovative state-of-the-art engineering and construction techniques. Thousands of workers from across the country came to build the dam, and providing for their needs in turn required many more workers. Both Hoover Dam and later war industries such as the Basic Magnesium Plant started the growth of the southern area of the state. Over the last 75 years, Clark County has grown in relation to the Reno area and today encompasses most of the state's population. The Nevada Test Site, 65 miles (105 km) northwest of Las Vegas, was founded on January 11, 1951 for the testing of nuclear weapons. The site is composed of approximately 1,350 square miles (3,500 km²) of desert and mountainous terrain. Nuclear testing at the Nevada Test Site began with a bomb dropped on Frenchman Flats on January 27, 1951. The last atmospheric test was conducted on July 17, 1962, though underground testing of weapons continued until September 23, 1992. Lake Tahoe on the California, Nevada border. The section of U.S. Highway 50 that runs through Great Basin National Park in Nevada is termed The Loneliest Road in America. The Bureau of Economic Analysis estimates that Nevada's total state product in 2006 was $117 billion. Resort areas such as Las Vegas, Reno, and Lake Tahoe attract visitors from around the world. Its agricultural outputs are cattle, hay, alfalfa, dairy products, onions, and potatoes. Its industrial outputs are tourism, mining, machinery, printing and publishing, food processing, and electric equipment. Prostitution is legal in parts of Nevada, in the form of brothels, but only counties with populations under 400,000 can legalize it, and even those counties may choose to outlaw it if they wish. Prostitution is illegal and offenders are prosecuted in Clark County (which contains Las Vegas), Washoe County (which contains Reno), and several other counties around the state. In portions of the state outside of the Las Vegas and Reno metropolitan areas, mining and cattle ranching are the major economic activities. By value, gold is by far the most important mineral mined. In 2004, 6.8 million ounces of gold worth $2.84 billion were mined in Nevada, and the state accounted for 8.7 percent of world gold production. Silver is a distant second, with 10.3 million ounces worth $69 million mined in 2004. Other minerals mined in Nevada include construction aggregates, copper, gypsum, diotomite, and lithium. Despite its rich deposits, the cost of mining in Nevada is generally high, and output is very sensitive to world commodity prices. As of January 1, 2006 there were an estimated 500,000 head of cattle and 70,000 head of sheep in Nevada. Most of these animals forage on rangeland in the summer, with supplemental feed in the winter. Calves are generally shipped to out-of-state feedlots in the fall to be fattened for market. Over 90 percent of Nevada's 484,000 acres (1,960 km²) of cropland is used to grow hay, mostly alfalfa, for livestock feed. Nevada is home to Nellis Air Force Base, a major testing and training base of the United States Air Force. Nevada is also one of only a few states with no personal income tax and no corporate income tax. The state sales tax in Nevada is 6.5 percent. Counties can assess optional taxes as well, making the combined state/county sales taxes rate in some areas as high as 7.75 percent. The capital of Nevada is Carson City, named for explorer Kit Carson. Founded in the early boom days of mining, Carson City became a thriving commercial center following the discovery of gold and silver on the nearby Comstock Lode in 1859. A lively freight and transportation center, the city was soon designated both the territorial capital and county seat of the new Ormsby County. It was designated the state capital in 1864, when Nevada became a state, and has retained that duty to the present day. The governor of Nevada is limited to two four-year terms in office. The Nevada legislature is a bicameral body divided into an upper house Senate and a lower house Assembly. Members of the Senate serve for four years, and members of the Assembly serve for two years. Members of both houses will be subject to term limits starting in 2010. As of 2008, the Senate was controlled by the Republican Party and the Assembly is controlled by the Democratic Party. The Supreme Court of Nevada hears all appeals. The court lacks the power of discretionary review, so Nevada's judicial system is extremely congested. There have been several newspaper articles accusing judges in Nevada of making biased or favored decisions. In 1900, Nevada's population was the smallest of all states and was shrinking, as the difficulties of living in a "barren desert" began to outweigh the lure of silver for many early settlers. Historian Lawrence Friedman has explained what happened next: "Nevada, in a burst of ingenuity, built an economy by exploiting its sovereignty. Its strategy was to legalize all sorts of things that were illegal in California … after easy divorce came easy marriage and casino gambling." Even prostitution is legal in Nevada (under the form of licensed brothels) in most rural counties (it is however illegal in Clark County, which contains Las Vegas, in Washoe County, which contains Reno, in Carson City, and in two other counties). Nevada's tax laws also draw new residents and businesses to the state. Nevada has no personal income tax or corporate income tax. Nevada provides a friendly environment for the formation of corporations, and many (especially California) business people have incorporated their businesses in Nevada to take advantage of the benefits of the Nevada statute. Nevada Corporations offer great flexibility to the Board of Directors and simplify or avoid many of the rules that are cumbersome to business managers in some other states. In addition, Nevada has no franchise tax. Similarly, many U.S. states have usury laws limiting the amount of interest a lender can charge, but federal law allows corporations to 'import' these laws from their home state. Nevada (among others) has relatively lax interest laws, in effect allowing banks to charge as much as they want, hence the preponderance of credit card companies in the state. Nevada, in a notable exception to its otherwise libertarian principles, is notable for having the harshest penalties for drug offenders in the country. Nevada remains the only state to still use mandatory minimum sentencing guidelines for marijuana possession. However, it is now a misdemeanor for possession of less than one ounce. In 2006, voters in Nevada defeated attempts to allow possession of one ounce of marijuana (for personal use) without being criminally prosecuted. Nevada is one of the states that allows use of marijuana for medical reasons (though this remains illegal under federal law). Nevada has very liberal alcohol laws. Bars are permitted to remain open 24 hours. Liquor stores, convenience stores, and supermarkets may also sell alcohol 24 hours per day. Nevada voters enacted a smoking ban in 2006 that outlaws smoking in most workplaces and public places. Smoking is permitted in bars, but only if the bar serves no food or is inside a larger casino. Smoking is also permitted in casinos, hotel rooms, tobacco shops, and brothels. However, some businesses do not obey this law and the government tends not to enforce it. Due to the growth of Las Vegas in recent years, there is a noticeable divide between the politics of northern and southern Nevada. The north has long maintained control of key positions in the state government even while the population of the Las Vegas area is larger than the rest of the state. This has fostered resentment as the north sees the south as a potential bully of majority rule (and a leech on its resources, mainly water and electricity) and the south sees the north as the "old guard" trying to rule as an oligarchy. However, due to a term limit amendment passed by Nevada voters in 1994, and again in 1996, some of the north's hold over key positions will soon be forfeited to the south, leaving northern Nevada with less power. Clark and Washoe counties—home to Las Vegas and Reno, respectively—have long dominated the state's politics. Between them, they cast 87 percent of Nevada's vote and elect a substantial majority of the state legislature. According to official statistics, 38.1 percent of voters are registered Republicans, 41.7 percent are Democrats, and the remaining 20.1 percent are Independents. As a result, Nevada remains a swing state in both state and federal politics. Democrat Bill Clinton won the state in the 1992 and 1996 presidential elections, and Republican George W. Bush won in 2000 and 2004. Democrat Barack Obama won the state in 2008. Incorporated towns in Nevada, known as cities, are vested with home rule powers, meaning that they are given the authority to legislate anything not prohibited by law. As a result of its rapid population growth, Nevada has a higher percentage of residents born outside the state than any other state. Las Vegas was a major destination for immigrants seeking employment by the gaming and hospitality industries from South Asia and Latin America during the 1990s and 2000s, but farming and construction are the biggest employers of immigrant labor. From the 1940s to 2003, Nevada was the fastest-growing state in the United States percentage-wise. Between 1990 and 2000, Nevada's population increased 66.3 percent, while the nation's population increased 13.1 percent. Over two-thirds of the population of the state live in the Las Vegas metropolitan area. According to the Census Bureau's 2007 estimate, Nevada had an estimated population of 2,565,382, which was an increase of 92,909, or 3.5 percent, from the prior year and an increase of 516,550, or 20.8 percent, since the year 2000. This includes a natural increase since the last census of 81,661 people and an increase due to net migration of 337,043 people into the state. Immigration from outside the United States resulted in a net increase of 66,098 people, and migration within the country produced a net increase of 270,945 people. According to the 2006 census estimate, Nevada is the country's second-fastest growing state. 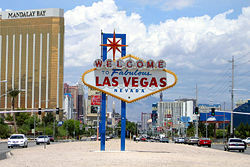 Las Vegas was America's fastest-growing city and metropolitan area from 1960 to 2000. It has grown from a gulch of 100 people in 1900 to 10,000 by 1950 to 100,000 by 1970 to have 2.5 million in the metro area today. According to the census estimates the racial distributions were as follows: 65 percent white American, 7.1 percent African-American, 6 percent Asian-American, 2 percent others (Native Americans and Pacific Islanders) and the remaining 20 percent were Hispanics or Latinos of any race. Nevada also has a sizable Basque ancestry population. In Douglas and Pershing Counties, a plurality of residents are of Mexican ancestry, with Clark County (Las Vegas) being home to over 200,000 Mexican Americans alone; Nye County and Humboldt County have a plurality of Germans; and Washoe County has many of Irish ancestry. Las Vegas is home to rapidly growing ethnic communities like Canadians, Scandinavians, Italians, Poles, American Jews, and Armenians—mainly aging transplants from East Coast states who came to retire. Many African Americans in Nevada are newly transplanted residents from California and the East Coast, but the U.S. armed forces, hotels, and domestic services have attracted black Americans since the 1950s. Since the California Gold Rush of the 1850s brought thousands of Chinese miners to Washoe County, Asian Americans have lived in the state. The Chinese were followed by hundreds of Japanese farm workers in the late 1800s. In the late twentieth century, many immigrants from China, Japan, Korea, the Philippines, and recently from India and Vietnam came to the Las Vegas metropolitan area. According to the 2000 U.S. census, 16.19 percent of the population aged 5 and over spoke Spanish at home, while 1.59 percent spoke Filipino  and 1 percent spoke Chinese. The largest denominations by number of adherents in 2000 were the Roman Catholic Church with 331,844; the Church of Jesus Christ of Latter-day Saints with 116,925; and the Southern Baptist Convention with 40,233. Some 77,100 Nevadans belong to Jewish congregations. The population surge in Nevada has resulted in overcrowded primary and secondary schools. The University of Nevada has campuses in Las Vegas and Reno. The Desert Research Institute, established in 1959, conducts research and studies the weather, water, and other conditions that affect deserts in every state and nations all over the world. Nevada enjoys many economic advantages as a whole, and the southern portion of the state enjoys mild winter weather, but rapid growth has led to issues of overcrowded schools. The state has seen rising crime levels and problems with transportation. According to state figures, there is a $1 billion shortfall in funds for road construction projects. Most recently, there has been warnings of water shortfalls in southern Nevada due to the population increase, and the Southern Nevada Water Authority estimates that there will be water shortages by the year 2010, despite plans to import water from rural and northern Nevada. Despite these warnings, the state remains one of the fastest growing in the country. Nevada experienced an economic downturn due to the housing market collapse in Las Vegas, which has one of the highest home foreclosure rates in the nation. This was coupled with many months of declining gaming revenue and higher prices for gasoline and consumer goods. The combination caused a $1.2 billion shortfall in the state budget, required by the state's constitution to be balanced. This in turn resulted in Nevada draining its "rainy day" fund of $267 million. Coupled with budget cuts, hard times are ahead for the Silver State. In August 2008, Boyd Gaming announced it would halt construction on a $4.2 billion project called Echelon, which was to replace the old Stardust Hotel and Casino, because of lack of funding and a souring economy. Air and water pollution are also concerns. The U.S. Department of Energy wants to build a permanent storehouse for radioactive waste at Yucca Mountain, though opponents are not convinced of the plan's safety. 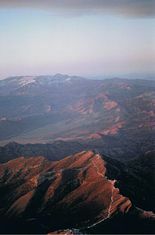 ↑ The distinction of highest point in Nevada goes to the summit of Boundary Peak, so named because it is very near the Nevada-California border, at the northern terminus of the White Mountains. However, Boundary Peak can be considered a subsidiary summit of Montgomery Peak, whose summit is in California, since the topographic prominence of Boundary Peak is only 253 feet (77 m), which falls under the often used 300-foot (91 m) cutoff for an independent peak. Also, Boundary Peak is less than 1 mile (1.6 km) away from its higher neighbor. Hence Boundary Peak can be described as not being wholly within Nevada. By contrast, the prominence of Wheeler Peak, 13,063 feet (3,982 m), is quite large and in fact it is the twelfth largest in the contiguous United States. Wheeler Peak is the highest point in a radius of more than 200 square miles (520 km²) and is entirely within the state of Nevada. ↑ National Climatic Data Center, Asheville, N.C., and Storm Phillips, STORMFAX, INC.
↑ Guy Rocha. Historical Myth a Month: Why Did Nevada Become A State? Nevada State Library and Archives. Retrieved November 15, 2008. ↑ Nevada Mining Association. Economic Overview of the Nevada Mining Industry 2004 Retrieved November 15, 2008. ↑ United States Department of Agriculture. Nevada State Agriculture Overview - 2005 Retrieved November 15, 2008. ↑ Susie Vasquez. October 6, 2007. State smoking ban sparks zone-change request for Gardnerville parcel Nevada Appeal News Service. Retrieved November 15, 2008. ↑ Les Christie. December 25, 2006. Growth states: Arizona overtakes NevadaCNN. Retrieved November 15, 2008. ↑ The Association of Religion Data Archives. Nevada State Membership Report Retrieved November 15, 2008. ↑ Desert Research Instute DRIdri.edu. Retrieved November 23, 2008. Energy Information Administration. Nevada State Energy Profiles Retrieved November 15, 2008. Nevada Department of Conservation and Natural Resources. Nevada Natural Resources Status Report Retrieved November 15, 2008. U.S. Census Bureau. Nevada Quick Facts Retrieved November 15, 2008. U.S. Department of Agriculture. Nevada State Fact Sheet Retrieved November 15, 2008. U.S. Geological Survey. Science In Your Backyard: Nevada Retrieved November 15, 2008.